The award-winning family-run fish and chip restaurant and takeaway and the volunteer led Railway are reinstating the age-old tradition of a special steam train service that combines a trip to the seaside with a delicious fish supper on-board. 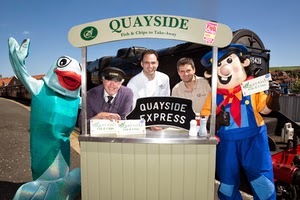 From June 13th 2014 passengers can hop on-board the Quayside Express every Friday between Pickering and Whitby and enjoy a scrumptious fish supper, complete with Quayside’s famous homemade batter, sustainable fish and mushy peas, on the return trip from the seaside town. “Fish was transported by rail, by the tonne from Whitby harbour in the early 20th century in order to fuel London’s fish and chip shops, and, since then, ‘fish and chips specials’ have been a long tradition on the railways so it’s fantastic to be reinstating such an old tradition with the help of Britain’s best chippie,” says Danielle Ramsey, marketing manager at the NYMR.